Was skeptical at first. But have found that time and again, this app is true to it's description and induces dreams. 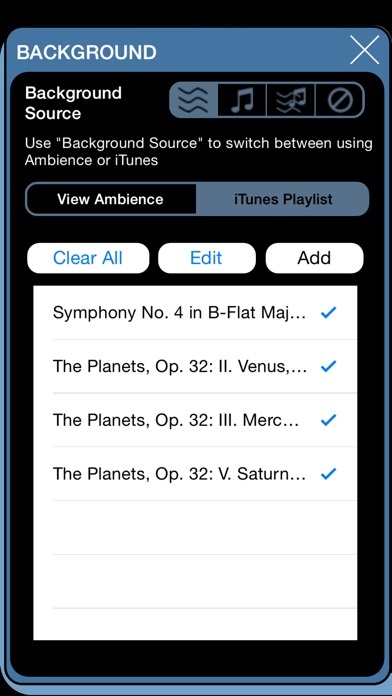 I think they need to revisit the iTunes playlist feature and general app startup. The iTunes playlist will sometimes just skip some tracks after a few seconds which can be very disruptive while trying to sleep. Also, when starting the app, the settings sometimes stay and sometimes will be from the last setting. Doing a save isn't useful since the restore doesn't work well if you try to restore based on a time to stop. Was a great app before the glitches. This app definitely does what it says it will do. I typically have dreamless sleep and have had memorable dreams all 5 nights since I purchased last weekend. Instructions say to use headphones but I've found that to be unnecessary if you have the volume up high enough...but just loud enough to hear it as you fall asleep. Also make sure to have it running all night since one cycle only goes for around an hour. Seriously impressive. Alpha mode is my favorite. Will be purchasing the other apps from this developer as well. 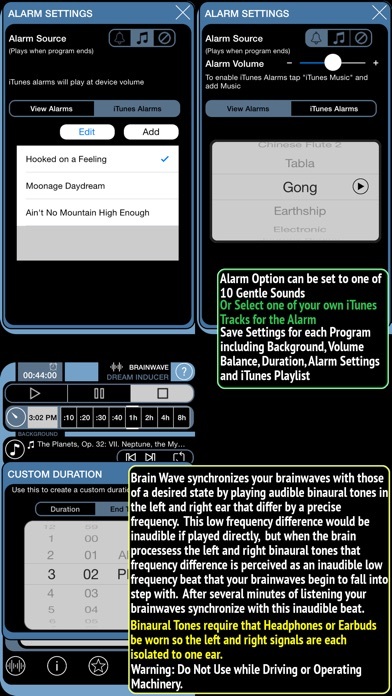 Fantastic app, great different sounds & options, I've really noticed a difference in my dreams & my ability to quickly fall back asleep if awakened during the night. My husband snores. Loud. I used to use earplugs. They didn't work. So I bought a white noise machine. One of those big ones they put outside a shrinks office. I would put that on my nightstand in addition to wearing earplugs. That didn't work. So I started putting it even closer to my head, right on my pillow. That didn't work. So I started putting the large heavy thing right on top of my head on my one ear, while the other ear was smushed against the pillow (with the earplugs of course). An unpleasant solution. The I got an iPod and found this app. Problem solved. Some earbuds shoved into my ears with this noise? Problem solved. And yes I definitely dream deeper and more interestingly. 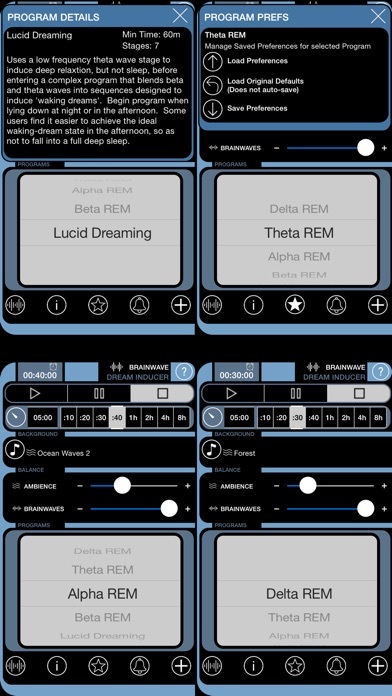 Been using it for years before all these other white noise apps were created and wouldn't think of trying out one of the others with tons of good ratings. Thank you banzai labs! You saved me! Great App! A Bargain. I no longer use sleep aid, and getting to sleep is much faster. I've used this app daily for several months not only to get to sleep, but more often when I'm working to tune out background noise and let me concentrate. What I most appreciate about it is that it is very soothing - a massage for the mind. ☺️ light sleeper to sound sleeper! Use every night! Was a light sleeper, but Helps me sleep deeper on all levels! I swear it helps me nod off to sleep and I remember crazy cool dreams in the am. Amazing so soothing puts me to sleep every time. Works great with My Bose headsets.. I recommend this to anyone that needs help falling asleep. Pretty cool app. I have difficulty getting to sleep and this app helps!! I too was doubtful at first,but I use this app daily now! Believe it or not this app does work!! The lucid dreams is Amazing!!! JUST GET IT!!!!!!! I use this app almost every night. I don't use it so much to promote dreaming as to just help me sleep. But guess what? It helps me get to sleep, which inevitably leads to vivid dreams. So I guess it's doing the job. Why did you remove landscape mode? Please bring it back! I've struggled with sleeping for years. This app as truly helped me. Thank you! This app is terrific, both as a relaxer and as a dream generator. I sleep better, and find my dreams both more intense and easier to recall when using it! Read the update news. Other than that, this app rocks! Got it 2 weeks ago and now I use it every night. Ever since school started I've had trouble sleeping but thanks to this app I can go into a deep sleep. I recommend turn ambience up and brain waves down, use headphones, delta rem, and do either forest, waterfall, or flowing creek for 30 minutes. I use this app most nights to help myself sleep soundly. It's been well worth what I paid. Originally downloaded to help with my insomnia. Have had multiple friends and family members download it since. Great functions-love the ability to choose a timed sleep cycle or a wake up time. This absolutely works. Helps me get to sleep and I reach a deeper state of sleep when I use it. HIGHLY recommend!!! Been using this app since the original version and I swear by its effectiveness!!! For starters, in case some of you came here looking for a silver bullet, the sound produced is supposed to be pleasant it is not supposed to be some sort of mechanism that produces dream chemicals or some bs. That being said it is not the only thing that can achieve this effect, even if the placebo helps weaker minded people. It is a conduit for ones own meditations, nothing more. Although I do like listening to the rhythms with rain in the background, or perhaps waves crashing, as I listen to it casually anyway. I find it does help meditate. My only complaint is that the whole UI is upside down as the most used buttons are at the tip top of the page (way to think that one out designers...). But overall I would recommend it based on my own preference. I have used this for several months. Requiring less sleep. More effectual sleep. I love this app. I would suggest to devs to include a left / right fader. In case of headphone abnormalities, and how different earbuds can fit different ears differently. Otherwise perfect. Very good app . I use it every night . It helps fall asleep and stay asleep . I was skeptical at first , but after using it . I'm very happy and content with the app . 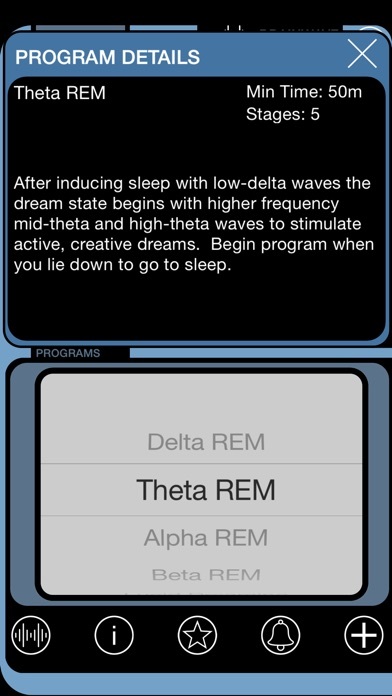 This is a great app for inducing sleep. Not sure it has helped me with much else, but I love that I can set a timer. It has helped me get off of sleep medication. i was skeptical at first, sure, but I figured "why not." and if you're thinking of downloading this app, and reading the reviews, you're probably a bit skeptical too. but trust me -- you won't be disappointed. I've only been using the app for about a week, using the Theta waves setting, and I love it. I'm having bright, vivid, realistic dreams every night, and I remember most of them when I wake up. I'm planning on working up to lucid dreaming, but even if I don't have any success, I'm completely satisfied with this app and how it works. Overall a great app. I like all the background music options. this is a great aid for sleeping for sure. 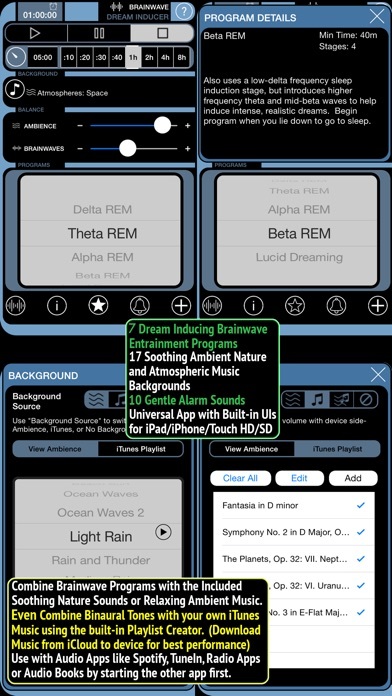 Amazing app, helps me sleep, different settings offer different types of sleep (deep, creative dreams, vivid dreams and lucid dreams) all do seem to bring out different levels of sleep. I love that you can customize and mix the sound your hear. I love drifting off to sleep with this. I have however had to turn off the waves, I'm not entirely sure but it seems to trigger my migraines. Correlation doesn't mean causation but it does happen quite frequently when I turn on the waves. I do wish they had a Humpback whale songs on their track lists. I rarely have trouble falling asleep but there have been occasions after a very stressful day I can't turn my brain off. I'll turn this app on and relax and the next thing I am aware of is my thoughts going off to a peaceful place. I wake up feeling well rested. I don't remember dreaming, but definitely falling asleep it puts my mind to ease. If you struggle with falling asleep I highly recommend this app and you never know it my allow you to have amazing dreams. I am a person who has the craziest, most out landish dreams nightly. I also have to listen to my favorite app each night that has storms crashing and banging all night. Loving to dream, I decided to give this a try. From the very first night my dreams have changed. They are completely unlike any of my "types" of "normal" dreams. It's like something has changed in my sleeping mind or this app somehow has unlocked deeper issues I have. And I dream about the most detailed things now. It's difficult to explain but I really look forward to my nightly "adventures"! I believe this really does what it says it does!!! I have definitely noticed an increase in dream recall using this app. It also is extremely effective at helping me fall asleep. I definitely recommend this!